Twin needling is sewing with 2 needles in your machine, and 2 spools of thread, at the same time! When you get the hang of this technique, it is so much fun, and the possibilities are endless. The bit that you are twin needling is the ‘leading’ otherwise known as Fusible Bias Tape. This is such a cool product and worth every penny. It comes in different colours & widths, but I use the 1/4″ tape with a 1/4″ twin needle (twin needles also come in different widths). And because it has been made on the bias, it curves really nicely! So here’s how you twin needle! Ever wondered what the extra spool holder & hole was for in your machine? As well as the hooks on the sides of your needle shank? Yep, you guessed it! Twin Needling. Now take both threads together, and thread your machine as normal, until you get to the needle shank. This is where you separate the threads again. Hook one thread to one side, and the other thread to the other side. Insert your twin needle unit in the same way you put in a normal needle and thread each needle. You should now have 1 bobbin thread and 2 top threads. Increase your stitch length to 3. Iron a small piece of fusible bias tape onto a scrap of fabric (always double your fabric) & practise your twin needling until you get the tension right (you may need to loosen your tension as the fusible tape is quite thick). 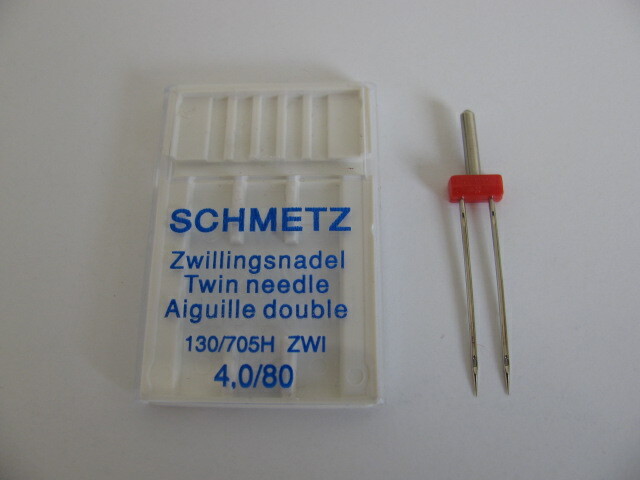 Now you are ready to twin needle your project. 1. Using bondaweb to stick down your design and then twin needle the ‘leading’ on top (check the compatibility of the bondaweb with the fabric you are using). This method is good for more intricate, curved designs. 2. Make an improve patchwork block and twin needle the ‘leading’ onto the right side of the seams. What you must remember when making stained glass patterns, is the raw edges of a length of bias tape must be hidden underneath another length of bias tape (rather like foundation piecing where the last raw edge gets sewn over by the next piece of fabric). Method 2 is a good way to start twin needling if you are a first timer! 1. Make an improve block to your required size. I made a 16″ square panel for a cushion front. 2. Study the seams of your block to find out which ones will need bias tape first, and which ones have ends that will need to be covered over by another piece of bias tape. Peel the back off the tape and start ironing on the sections that need to be sewn down first. Make sure the tape ends reach right into the seams. 3. Baste the block onto some wadding, backed with calico/sheeting. 4. Take your block to the machine and start twin needling the smaller pieces of bias tape that are stuck down. You don’t need to start or finish with a reverse stitch, just make sure you sew right to the ends of the tape. 5. Continue building up the layers of bias tape until all raw edges & seams are covered. 6. Trim off any excess wadding/backing. 7. Attach a cushion back and binding if desired. 8 & 9. Sit back and admire your handiwork! Thank you for taking the time to read this tutorial. I hope you have been inspired to try something new and have loads of Twin Needling fun!